An egg, a package of coating mix and a hot oven are all you need to turn veggies and mushrooms into delicious Crispy Veggie Fries. Preheat oven to 425°F. Beat egg in small bowl. Dip vegetables in egg; shake in coating mix. 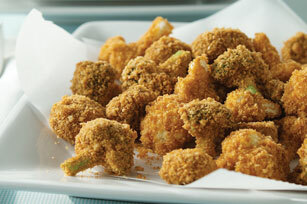 Place breaded vegetables on lightly greased shallow pan. Bake 20 min. or until crisp and golden brown. Serve with your favorite KRAFT Dressing for dipping.